GREAT BAY - The Collective Preventive Services (CPS), a government agency under the Ministry of Public Health, Social Development & Labour, is calling on residents to step-up mosquito prevention measures due to the weekend of torrential rainfall. Mosquito fogging did start about a week ago but had to be halted due to rainfall. Fogging will resume shortly. Residents are advised to step-up by taking measures at home and at their business to mitigate mosquito breeding such as the Aedes Aegyptimosquito. Minister of Public Health, Social Development & Labour Hon. Cornelius de Weever, ‘Get Checked” campaign, is in line with the responsibility of residents, and business owners, to check around their homes, and businesses in order to reduce breeding sites of the Aedes Aegypti mosquito, and making themmosquito-free zones. Minister De Weever is also calling on residents to encourage and ensure that their neighbor (s) clean their yard in order to be more effective in eliminating breeding sites. Mosquito foggingis one intervention of several, and the main measure is for every household and business to take action by removing potentialmosquitobreeding spots in and around their premises on a daily basis. Residents must bear in mind that rain events can disruptmosquitofoggingactivities. Homeowners should remove containers or turn them over; boat owners who have boats stored on land should make sure the drains are open for water to run out rather than accumulate creating a breeding ground for mosquito’s; spouts should be cleaned; overgrown vegetation should be cut; and old tires should be cut up. PHILIPSBURG – The House of Parliament will meet in a plenary public session on November 10th. The plenary session is set for Monday at 2.00pm in the General Assembly Chamber of the House at Wilhelmina Straat #1 in Philipsburg. The first agenda point is incoming documents; the second agenda point is the draft National Ordinance regarding the Bureau of Intellectual Property with respect to current rules, responsibilities and obligations. WILLEMSTAD, Curacao - Civil Servants, persons or legal entities, who refuse to cooperate with requests or inquiries from Ombudsman Institute of Curacao are liable to criminal prosecution and can be penalized with a hefty fine. This is stated in the draft ordinance amending the Ordinance Ombudsman, which was submitted to parliament by the Ombudsman on October 30 of this year. The draft ordinance amending the Ordinance Ombudsman includes, among other things, the introduction of a system of sanctions for those who do not cooperate with the Ombudsman. SIMPSON BAY, SXM Airport - In its efforts to promote a healthy lifestyle, the Princess Juliana International Airport, SXM, is currently offering complimentary Zumba classes to employees interested in its fitness program. About 30 staff have enrolled in the program. Conducted by Ms. Patricia Pantophlet of Patty’s Zumba, this form of exercise incorporates fun footwork and body movement set to the Caribbean rhythms of salsa, cumbia, soca, reggaeton, merengue, samba and zouk. In addition to the twice weekly Zumba classes, employees have also enjoyed outdoor activities. Pantophlet explained that a walk was organized to kick off the fitness program. The walk was from the airport terminal building over the causeway and back to terminal building. SXM Airport employees also participated in a hike to the natural pool in Point Blanche. “There is a lot more on the program for them,” Pantophlet said. Though it was initially planned to last one month, SXM has graciously extended the fitness program by two months, given the interest shown by the employees. 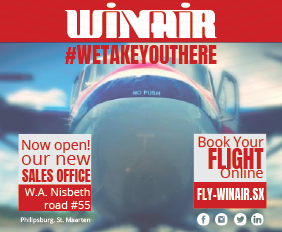 SIMPSON BAY, SXM Airport – Locally owned AirStMaarten has access to a Lear 55 Jet to carry out private jet charters on demand for clients and agents connected with the airline. Those interested in utilizing the jet service can already start making inquiries with via http://www.airsxm.com/private-jet-charters. You can also inquire about other aircraft that AirStMaarten has access to which includes turboprops to long range and wide body jet aircraft. AirStMaarten owner Terrance Rey stated that he also offers regular commercial flights, cruises, vacation packages and Caribbean Specials. PHILIPSBURG - The Director of the Immigration and Border Protection Service (IBP) would like to inform the general public that as of November 1, 2014 new visa regulations went into effect for the Dutch Caribbean and St. Maarten in particular as efforts continued to improve travel and economic opportunities within the region as well as the necessary streamlining of policies in accordance with European and international regulations. Travelers from the following countries only; Bolivia, Colombia, Cuba, China (new), Dominican Republic, Guyana, Haiti, India (new), Jamaica and Peru, are exempted from the Dutch Caribbean visa when in possession of a valid, multiple entry visa from the United States and Canada. All travelers, regardless of nationality, are exempted from the Dutch Caribbean visa when in possession of a valid, multiple entry Schengen Area visa. COLE BAY - On Tuesday November 4th at approximately 05.00 p.m. the suspect in an ongoing investigation concerning an attempted murder/severe ill-treatment with a weapon, was arrested by police in the vicinity of Fisherman’s Wharf in Cole Bay. The suspect with initials A.L. (24) was involved in a fight on November 2nd at a bar in Cole Bay. During this fight the victim was seriously wounded after being stabbed. The suspect cooperated completely with police during his arrest. PHILIPSBURG - Bureau Telecommunications and Post St. Maarten (BTP-SXM), successfully concluded its meetings with the Regulatory entity and -administration in France and the Netherlands, during a working visit. While the meeting with the French regulatory entity and administration representatives focused on an extensive approach towards spectrum coordination, the meeting with the representatives of the Dutch regulatory agency and administration focused on matters regarding the division of numbers, codes and call names relevant to the telecommunications-, radio broadcasting and maritime industries in St. Maarten. The documents executed during this visit provides the basis for a steady and continuous development of the telecommunications industry in St. Maarten in particular the mobile section, as well as for an enhanced collaboration and cooperation between parties. The outlined approaches in the executed document will be shared in the weeks to come with counterparts for review and discussion, so an extensive coordination of spectrum approaches, allocations and use may be ascertained. Through the executed undertaking BTP-SXM is now in a position to commence with the allocation of spectrum for LTE deployment in St. Maarten. In closing Mr. Carty pointed out that without the contributions of his dedicated team and the desire of the French and Dutch counter parts to collaborate, this result could not be achieved. The Protocol and its amendment are posted on the website of BTP-SXM: www.sxmregulator.sx. PHILIPSBURG – The House of Parliament will meet in a Central Committee session on November 06th. The committee meeting is set for Thursday at 10.00am in the General Assembly Chamber of the House at Wilhelmina Straat #1 in Philipsburg. The first agenda point is a draft National Ordinance to adjust the Stamp Ordinance related to Passports; the second agenda is advice regarding the installation and composition of the Permanent and Adhoc Committees of Parliament. The third agenda is advice regarding the installation and composition of the Committees of the Latin American Parliament (Parlatino); and the fourth agenda point is composition of the delegation to attend the Commemorative General Assembly on the occasion of the 50th Anniversary of Parlatino on December 6th and Meeting of Young Parliamentarians 2014 on December 4th and 5th.